106 mins. Rated R for crude and sexual content, pervasive language, and some drug use. I never thought Seth MacFarlane (A Million Ways to Die in the West) would host the Oscars. I also never thought he would nominated for his own film that very year, but he was. And he was. 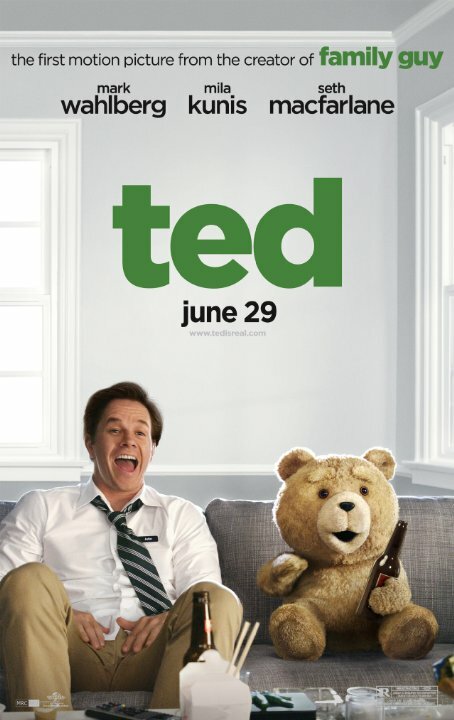 Ted is the story of John Bennett (Mark Wahlberg, Boogie Nights, The Gambler) and a wish he wished when he was but a child. After receiving a teddy bear for Christmas, John dreamed that Ted would come alive and be his friend forever. That wish came true, and now, years later, John has become an adult, has a girlfriend, Lori (Mila Kunis, TV’s Family Guy, Black Swan), and wants to shed all the piece of his childhood. 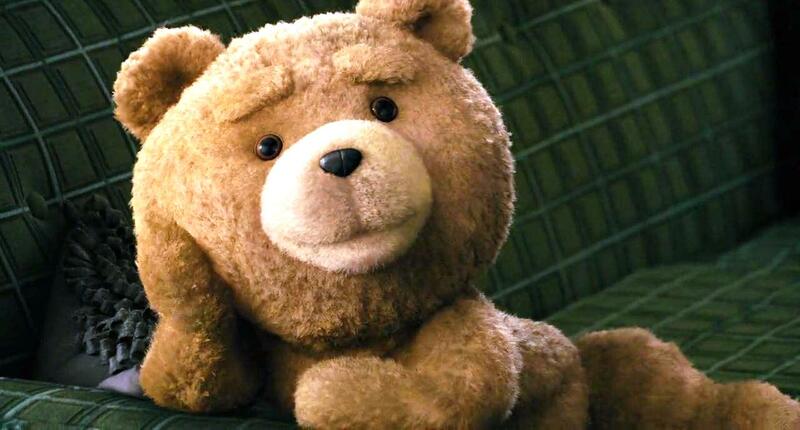 But is he ready to lose Ted (voiced by Director MacFarlane)? Now, John has to decide what is truly important as a loser boss named Rex (Joel McHale, TV’s Community, A Merry Friggin’ Christmas) threatens to take Lori away and a psycho fanboy named Donny (Giovanni Ribisi, Avatar, Selma) threatens to steal Ted. Seth MacFarlane is great at taking cutesy little stories with lessons about love and growth and punctures them with toilet humor and crude content. I thought the plot was nicely laid out while flipping situations like a best friend moving out and morphing it into the story of a teddy bear. The performances are more a live-action version of a Family Guy episode than anything of actual merit, but that doesn’t take away from the film’s enjoyment. Ted’s motion capture performance by Seth MacFarlane looks really good and blends into the film well. I loved the send-ups to films like Airplane! and Flash Gordon. I loved the Cheers DVD segments, and the wonderful flash Family Guy way about this film. It harkens back to the more simplistic of the cartoon’s episodes back before the first cancellation. Ted is a lot of fun if you are willing to accept the extreme crudeness of the piece. It is a hilarious time at the movies, especially for those who can “get” some of the more selective jokes. The Trailer for the Sequel to Magic Mike is XXL!